Is your MINI Summer event schedule feeling light? Fancy a bit of a road trip? Want to fulfill your dream of **finally** making it into the Guiness Book of World Records? Then friends, read on! 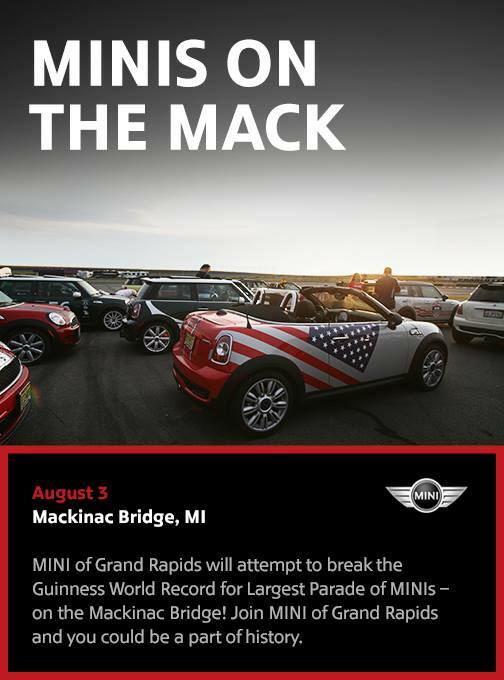 MINI of Grand Rapids is organizing an event for Saturday, August 3rd, that will be (hopefully) bringing over 1,450 MINIs to the Mackinac Bridge to assemble the largest parade of MINIs ever! And guess what, they really want you to join them! Summer road trip to Michigan anyone? RSVP and all that on their Facebook page. Full details that we have so far are listed below. >MINIs on the Mack will take place on Saturday, August 3rd and will culminate with a mass crossing of the Mackinac Bridge. >Fireworks at Dusk on the lakeshore! >An official registration website will be available soon! Heck yes!! Can’t wait to drive up for this Event! Be sure to RSVP on the Facebook page to help them get an idea of the head count!